Welcome to day 3 of release week at SugarPea Designs! We’ll be showcasing new products every day this week! The new products will be available this Friday at 6 p.m. Eastern time! Today we’re highlighting the Flurry of Warm Wishes and Pine Cone Greetings sets. 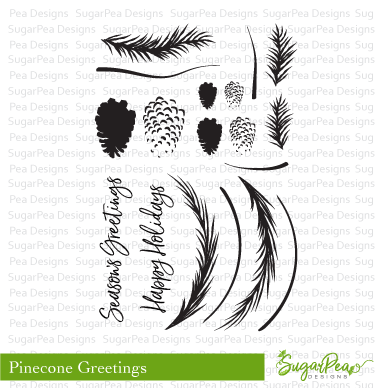 There is a matching SugarCut set for Pine Cone Greetings too! I’ll be using these sets over and over again this holiday season! Is this not the most beautiful snowflake set you’ve seen?!?! Kerin, love your cards. Our snowflake cards are almost the same color palette…you can’t go wrong with pink. Very pretty cards! Both new sets are so lovely. Wow!!! Two beautiful cards!!! Love the colouring!!! WOW! That pinecone wreath is stunning! Fantastic cards! Your wreath is gorgeous! Wow! Love your cards. Your right, this Snowflake set is the best. I love that a couple of the design team have made pink snowflakes. Beautiful cards! I really like the layering set, and the large snowflakes. Thank you thank you thank you! The wreath is exactly what I thought this would do…I was right! It’s just beautiful. Beautiful cards. I love the gray and pink colors on the snowflake card. I love your cards! Your color choices are wonderful. Very beautiful cards ! Love the traditional look of your first card but my favourite is your soft and delicate grey and pink Snowflakes one ! So gorgeous ! Thanks for sharing and for inspiring. Gorgeous cards!! I love your wreath and pink snowflakes!! Gorgeous wreath card and love the colors on the snow flake card. Love that your background looks like a coffee splatter! These are two gorgeous cards !! Adorable cards, such sweet images and lovely stamped details. Beautiful cards, the wreath is gorgeous but I love love love this snowflake stamp set! Such a pretty color combo on the blue and pink!